← Do You Follow Politics? This entry was posted in General Political Science and tagged 1980, Independent, Jimmy Carter, John Anderson, National Unity, President, Ronald Reagan. Bookmark the permalink. I think that the main reason behind an Independent never winning a Presidential election is because they do not belong to a main group (dem./repub.) and their perspectives change constantly. There isn’t any issue that they are completely for or strongly against, and I’m not sure if American citizens are confident in their constant changes. I remember watching a video that explained why Independent candidates never win the Presidency. It explained that say you have a democrat, a republican, and an independent. If your a republican but you like what the independent said so much that you vote for her/him you’re actually helping out the democrats because that’s a vote the republican lost and vice versa. I think it is difficult for an Independent to win a Presidential election because they don’t belong to a certain party, Democratic or Republican. I believe Americans vote for the party that shares their views. Some people may not care who the nominees are but will vote for which ever party they believe is the “right one”. I strongly agree and in my opinion it is difficult for an independent to win a Presidential election because they are neither Democrats or Republicans. They basically have no one to rely on but the people that believe EXACTLY what the independent believes and those are the only people that will vote for him/her. People like the IDEA of an independent but in the end, they will choose a side because society in general prefers to be a part of a group than on their own. I think it is difficult for an independent candidate to win as a president because they have no back up. To my understanding, Democrats and Republicans have certain beliefs and ideas that people either like or dislike. People sometimes vote for their parties because they share the same ideas. It is not always like that because sometimes people don’t look at the party but at the person running for president. I also think that it is difficult for them because they have no one to lean on, they have no one to turn to for support, therefore they never win. I believe that an independent candidate chances of winning an election are low because typically, people tend to want to be part of a group of which seems most people are following. In other words, voters want to have a leader who has his own followers, knows how to get things done properly according to time and will be successful at doing so. If an individual decides to run independently, of course it is not a bad thing to do so, but others will see it as a weakness. Maybe the person cannot seem to get along well with others, or maybe people do not want to give their support to that individual. In the end, anyone can run for a position independently and win, however, it is the right words one must say before making such decision to take on an election by yourself. 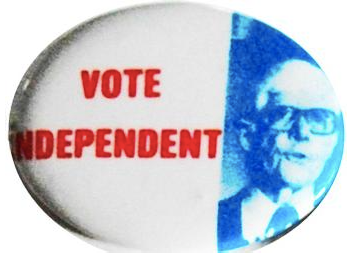 I believe it is hard for people to back independent candidates because their views change frequently. These same views seem to be shared by either the democrat or republican candidates making the voters question them more. One other thing I question is how the independents would ever build a trust in the House or Senate members in order to get items passed. I believe by having this type of backing with one party or the other would give voters more confidence that issues they feel strongly about might great resolved in some way. These are just a few of the reasons I believe an independent will always have a tougher time winning the presidency. I think the chances of the independent winning are slim to none. First of all pick a party. You are either Democrat or Republican. People vote for their party no matter who is running. I’m a Republican and I wouldn’t probably care who was running, I would vote for them over a Democrat. Its hard to happen because the major parties already have advantages. Republicans and Democrats running for presidency already have huge supporters, especially from certain states, being hard to change their tied in views as to what they see as being right. People are afraid of change and I believe this also takes a tole on independent candidates running for presidency. I would think it would be harder for them to win elections because the independent party is not very popular and people ten to think they have to either be a democrat or a republican. Since they are not as popular it would also be harder for them to raise money for their campaign. Without necessary funds they cannot get there name out there like the politicians with a lot of money and popularity. I believe it is difficult for an independent party to win an election for many reasons. The biggest reason being the funding/backing from business that backs dem./repub. parties. You can also take into account that people are less likely to trust an independent, most people are likely to vote for the candidate from the party whose beliefs line up with theirs, rather than gamble on one wildcard. I think it is very difficult for an independent candidate to win the presidency because many people prefer and want to belong to a certain group. Other than the fact that most of the people have already chosen a party. Which I believe they will keep voting for no matter who is running as candidate. To this they don’t even pay attention or care about the third party. One of the reasons for the independent party not being able to compete very well against the two main parties (democrats/republicans) is because they do not have the funds to be able to supports their campaign. This lack of funds leads to less promos, and adds on T.V. or newspapers so they are not nearly as popular with the average Joe who does not follow politics very heavily. The reason independent candidates have such a difficulty being elected is because they are a big question mark. They don’t belong to one solid well known party that everyone has grown up hearing about. People know what Republicans and Democrats stand behind, but not enough people are ready to take the leap of faith in trusting an independent canidadate due to uncertainty. We are a two party system that doesnt waiver in the face of opposition. Its not going anywhere anytime soon. A two party system is the staple that makes government legislation and organization so uniform. An independent wont be elected, because that would require a candidate to actually voice their views instead of mudslinging and potentially lose voters. Personally i believe that we all tend to lean to republican or democratic. Being independent takes away from a large scale of the voters that aren’t willing to put the thought forth to vote for the individual. This is the main reason i think that he finished 3rd. It is very rare for Independent’s to be voted into office. There are many reasons behind it, but I think the best example, one in which we all can learn from, would be that of Jesse Ventura. He is a former governor of Minnesota, and he got elected as an independent. Jesse has been on many political talk shows, and at some point in every show, the host has asked Jesse if he will be running for President in 2016. He says that he would consider it, but two criterion must be met. He wants to have ballot access in all fifty states, and he wants to be allowed in the debates. Now, I don’t know much about the inter-workings of presidential elections, but the fact that these two things are not guaranteed to him just because he is not a democrat nor a republican speaks to the flaws of our “two party dictatorship,” as Jesse calls it. Jesse often points out that people in general believe competition is good for the economy, but in the political system, that does not seem to be the case. The reason why there has never been an Independent president is because the U.S. runs on a two-party system, and has done so for a very long time. This two-party system means that the majority of the problems are broken down and split between two separate groups of people who usually always take opposing sides. The parties are rivals and competitors, but the parties support their own members financially, idea-wise, and publically. Due to this support, those who are running without a party cannot really hope to compete as they do not have the same resources.